Rich or Poor, we all have to deal with our finances. We have daily needs such as groceries and other expenditures. We have monthly bills that come in online or in our mailbox. We all need financial tips and guidance. When a person is single, proper financing is difficult enough. When a couple marries, each usually brings a set of financial obligations to the marriage as well. This only doubles the problems every newly-wed couples must face. This applies not only to newly-weds but to everyone as well. We all know that today, our credit score is of paramount importance. We all strive to get (or keep) that score at 750 or higher. Of course, we also know that isn’t so easy. Every time we apply for any sort of credit, this comes back as a hit on our credit report and these alone, even though we didn’t actually make a purchase, can lower that score. Errors turn up on credit reporting companies as well, so it’s advisable to check once in a while. There are a number of free sites that you can use to check. As mentioned above, finances, especially credit card debt can haunt a single person. When a couple marries, each may bring a nerve-rattling load of credit card debt along to the wedding ceremony. Another difficulty that can stand in a couple’s way is communication. It is of vital importance that a couple refrains if at all possible, from arguing or pointing a finger of blame. It’s quite true that some individuals are prone to spending thoughtlessly. A valid reason for this is that whipping out a bit of plastic is nothing at all like shelling out real hard cash. People don’t seem to see plastic in the same way they see cash. Of course, while there are other before and after-wedding debts that turn up, the big winner is plastic. These days, nearly every business enterprise offers credit cards. They’re so easy to get and so easy to use that they often tranquilize us. With a pocket or purseful of credit cards, we not only feel rich but powerful. We enter a shop and see a pair of really great shoes on sale. It’s now or never, so we walk out with our shoes and have just added $300 to a credit card that we don’t even quite realize will be charging us 19% interest on that loan. After all, that is a loan. We just borrowed $300 at usurious interest rates from a lender. The people who issue credit cards make it sound as if their cards are a free gift opportunity. For every purchase you make, you get cash back. You rack up mileage on airlines to romantic places as they entice you to believe that having that credit card will somehow make you rich. While a person with excellent credit can have certain credit cards with a low-interest rate, it’s still very easy to over spend. The tip here is to sit down with your other half and very calmly try to work out a plan to concentrate your payments on the credit cards with the highest interest rate. Little by little, you can pay them off, but you can still keep them since canceling them may not help your credit score either. However by ‘keep them’ we mean to keep them in the safe or in the back of a drawer. Forget you have them till they expire. Once married and settled in, you and your other half should try to make plans for the future. In saying this, we mean, plans for getting out of unnecessary debt and staying out. Lending and borrowing are good and necessary parts of our world. This has been going on since earlier times. The very term bankruptcy dates back to the days when money exchangers and lenders sat outside temples on little benches. Even in those days, it was recognized that sometimes people simply had no more assets and could no longer continue. That person was given respite by allowing him to ‘break his bench’ which translates to bankrupt. But bankruptcy is not the easy way to get out of paying our debts. Most people consider it onerous and only a last resort, and so it should be. If you absolutely have to declare bankruptcy, there are many attorneys who specialize in this and for around $1,000 they can get you through it. But now you have that bankruptcy hanging over your head and prominently displayed in your credit report (reflected naturally in your lower credit score). This will remain on your report for ten years and perhaps even longer unless you can remind the credit reporting company that your ten years are up. 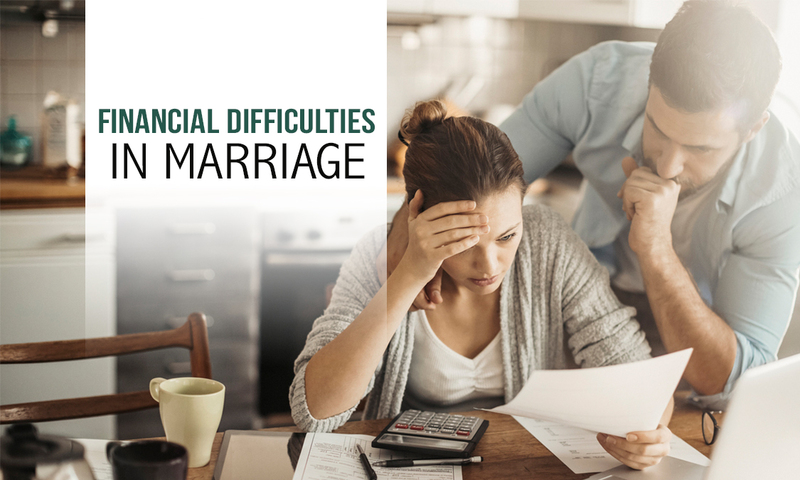 Our takeaway here is that when you plan to marry, you should sit down together and have an open discussion about current debt, future debt and what you, as a couple can do about it. Your largest debt would, of course, be your home, and this followed by one or two automobiles. Aside from the monthly payments, you have to consider all the ancillary expenses that go with houses and vehicles. Frightening, yes, but people have been managing to do this almost since they emerged from caves, and we’re still here!